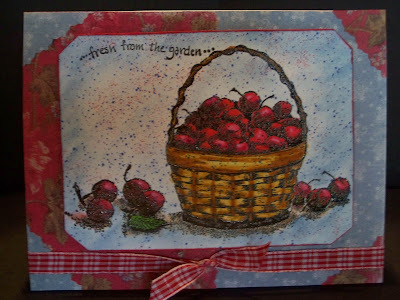 Another wonderful stamp from Rubber Cottage, Medina, Ohio. Background paper is by Daisyd. Stamped and colored, used the blow pens for dots, then chalked the background. We had a wonderful week of cooler temps, now it is supposed to heat up again. But, it is late August, and soon we will be complaining about the cold.